Above: Model output from analyses using tree-ring data by Denver Water (left), US Bureau of Reclamation (middle), and Salt River Project (right). Click on the images for more information about these applications. As informal, qualitative guidance for water managers, stakeholders and decisionmakers. 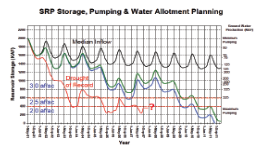 For example, as a graphic in a brochure to inform irrigators about long-term drought variability. For quantitative assessments of long-term hydrologic variability. For example, assessing the severity and/or duration of a drought in the observed record in the context of the longer reconstructed record. As direct inputs into hydrologic models of a water system. This allows water managers to model system performance under the tree-ring reconstructed hydrology, as they would do with the gaged hydrology, but under the broader range of conditions in the reconstruction. This typically requires additional processing of the reconstruction (annual values) to ingest it into the system model, which may require monthly, weekly, or daily time steps, at many nodes. Of these three types, the third is the most challenging because of the need (in most cases) to transform the tree-ring reconstruction so it can be used for model input. Below are brief summaries of several recent or ongoing applications of tree-ring reconstructions, listed by basin. Click on the name of the water agency/utility to go to the summary of that application. After each summary a contact person is listed for more information about that application. With Hydrosphere Resource Consultants, the City of Boulder developed a Drought Plan to identify impending droughts and respond with appropriate management strategies. The Drought Plan was based on an analysis of the climatic and hydrologic aspects of droughts that have affected Boulder’s water supply, which mainly comes from the Boulder Creek watershed, with the rest coming from the upper Colorado River watershed. The 95-year gaged record of streamflow was extended using a 300-year tree-ring reconstruction of Boulder Creek annual streamflow. The reconstructed flows were then run through a model of Boulder’s water supply system to test the effectiveness of various combinations of drought recognition triggers and drought response strategies over the 300 years of tree-ring based hydrology. As the Drought Plan was being completed, extreme drought conditions were unfolding, resulting in record-low streamflows in 2002. The Drought Plan allowed Boulder to respond effectively to this drought. This work for the Drought Plan was built on for a recently completed (2009) study led by Stratus Consulting, along with Hydrosphere and scientists from the University of Colorado and NOAA, with funding from the NOAA Climate Program Office - Sector Program. Updated reconstructions of streamflow for Boulder Creek and summer temperature for northeast Colorado were generated specifically for this project. Using a non-parametric k-nearest-neighbor technique, monthly temperatures, monthly precipitation, and gaged streamflow from instrumental record (1953-2002) are resampled to produce simulated streamflows for 1566-2002, with corresponding monthly temperature and precipitation, that are conditioned on the tree-ring-reconstructed streamflows. Essentially, this process disaggregates the paleo streamflows into estimated climatic variables (monthly precipitation and temperature) so that those variables can be manipulated independently. The simulated monthly temperature and precipitation are then input into a snowmelt-runoff (SRM) and water-balance (WATBAL) model to produce modeled Boulder Creek flows. Then changes in temperature and precipitation forecasted from climate models are combined with the paleodata to produce simulations of past hydrology under plausible future climate conditions. This approach allows water managers to assess the joint risks of climate variability (as more fully seen in the paleorecord) and climate change, by examining what would happen if the droughts of the past occurred again under warmer and potentially drier conditions. Denver Water has used the flow reconstructions to help model the yield of their system under a broader range of conditions than those seen in their 45-year model period (1947-1991). Denver Water took the annual flow values reconstructed from the tree rings, then used a “model year-analog” method to derive a plausible daily hydrology for these years. For example, if the reconstructed annual flow value for 1717 was closest to that for 1951, among the 45 model years, then the daily hydrology for 1951 was used for 1717. If a reconstructed year (like 1685) was beyond the range of the model period, then the daily hydrology for the closest gage year (2002) was scaled up or down to match the reconstructed annual flow. Then, the daily flows were input into a modified version of their water supply model, PACSM (Platte and Colorado Simulation Model). PACSM was then used to simulate the entire period (1634-2005) using the tree-ring data (1634-1946) and gage data (1947-2005), to determine what level of demand could be met through all years, and determine what level of demand could be met during various dry sequences. The modeling results indicated that the reconstructed drought of 1845-1848 (critical period: summer 1844-spring 1848) would cause Denver Water to deplete its storage down to its strategic reserve, even with the progressive application of water use restrictions. This is a greater depletion than was produced in the same modeling run by either the recent 2000-2004 drought, or the 1953-1956 drought (critical period: summer 1953-spring 1957), which is the design drought for Denver Water. In fall 2007, the Colorado Water Conservation Board commissioned a study, called the Colorado River Water Availability Study (CRWAS), to answer the question, “How much water from the Colorado River Basin System is available to meet Colorado’s current and future water needs?” A draft CRWAS report was released in April 2010 (see below for link). The CRWAS, as with similar studies in the past, systematically assessed the observed flow records and history of depletions to project future water availability. It brought in two additional sources of information. The first is projections from climate models (GCMs), to account for the potential impacts of rising future temperatures and other climate change on water supply and agricultural water demand. The second is what is called “alternative historical hydrology”, derived from tree-ring data, to account for past hydrologic variability more extreme than that seen in the observed record, which could recur in the future. The two types of data were used separately and also in combination to “perturb” the observed flows and assess the impact on water availability. The tree-ring analyses for the CRWAS were conducted by AMEC Earth and Environmental. They used a method similar to that used by the US Bureau of Reclamation in the analyses for the Powell-Mead EIS, which extracts system-state (wet/dry) information from a tree-ring reconstruction. As in the Reclamation EIS, for the CRWAS analyses the transition probabilities for system state were derived from the Meko et al. reconstruction of the Colorado River at Lees Ferry, AZ (762-2005), and then that information will be used to generate flow time-series for each of the nodes in both Reclamation’s Colorado River system model (CRSS) and the CWCB’s system (StateMOD) to run the analyses. The US Bureau of Reclamation’s Aspinall Unit (Gunnison Basin, Colorado) is preparing an EIS for its operations to support endangered fish recovery in the Gunnison River and its tributaries. As with the Bureau’s EIS process in the Lower Colorado, there has been an effort to use “alternative hydrologies”, specifically tree-ring data, in the assessment of different management alternatives. The strategy for applying the tree-ring data is very similar to that described for the Lower Colorado: the 429-year tree ring reconstruction is bootstrap-resampled in 30-year blocks, then system state information (three states in this case: dry-normal-wet) is extracted from the tree-ring data, and then flow magnitudes taken from the observed record (1937-1997) are probabilistically assigned to each paleo-state using a non-parametric k-nearest-neighbor technique. This creates a rich variety of 30-year sequences with “paleo-conditioned” flows. Then a sequent peak algorithm can be used to determine the storage required to meet various yields, given a particular drought deficit associated with a flow sequence. The results from the paleo-conditioned data can then be compared to those derived from the observed flow record. Unfortunately, a judicial decision in 2008 to fast-track the EIS meant that these tree-ring analyses were not used in the EIS. A joint research project between Salt River Project (SRP) and the University of Arizona’s Laboratory of Tree-Ring Research (LTRR) investigating the occurrence of droughts in the Upper Colorado River basin and the Salt-Verde-Tonto River basin, both of which supply water to SRP. In Phase I of the project, reliable tree-ring reconstructions of streamflow back to 1521 were developed by LTRR for both basins, and it was found that extreme flows (high and low) in both basins are strongly synchronous, and that it was rare for one basin to have high flows when the other had low flows. The Upper Colorado basin, then, is not a reliable buffer for shortages in the Salt-Tonto-Verde basin. It was also found that synchronous low flow years tended to cluster in time, which would heighten water stress on SRP. Further examination of the Salt-Verde-Tonto flow reconstruction (back to 1200) showed that there were eight droughts in the past 800 years that were at least as severe as the 1950s design drought (six years) and the current (1995- ) drought. One drought, from 1575-1585 (11 years), was clearly more severe than either of these. A simple model of SRP’s current water allotment and groundwater pumping scenario was run using the reconstructed flows for 1575-1585 as inputs. This modeling showed that SRP’s storage would be fully depleted in the last year of this 11-year drought. A slight modification to the pumping/allotment scenario resulted in some storage being retained through the drought. Thus, the tree-ring data can be used to test the robustness of the SRP system, under different policies, to droughts worse than seen in the gaged record. In Phase II of the project, new tree-ring cores were collected in 2005 and combined with existing collections to produce a new tree-ring based streamflow reconstruction for the Salt+Verde+Tonto watershed covering the period 1330-2005. The new reconstruction reveals that recent individual years (1996 and 2002) were unsurpassed in terms of low flow, with 2002 having an unprecedented number of locally absent (missing) rings. The multi-year persistence of the current drought of 1996-2006 was not unprecedented in the reconstruction. The median interval between “drought relieving” wet years was 3 years, the longest interval was 22 years (1382-1403) and 28 other droughts were more continuously severe in terms of “consecutive years below normal.” The overall conclusion is that despite the single-year severity of 1996 and 2002, the current drought is by no means unique in the long-term record. The updated collections will also include separate measurements of early- and late-season tree growth too see whether seasonal information useful to water managers can be extracted from the tree-ring data. SRP expects to once again examine its water allocation and drought planning process using the results of this extended chronology. Reclamation's intent was to use "alternative hydrologies" (i.e., providing flow information beyond that in the gaged record) for modeling that would support the development of shortage criteria and coordinated operations for Lake Powell and Lake Mead. Tree-ring reconstructions were an obvious choice for this purpose, but stakeholders had expressed concern about the accuracy of the tree-ring data in estimating flow magnitudes, particularly during extreme droughts. Analysis of several different tree-ring reconstructions of flow at Lees Ferry showed that while the reconstructions sometimes differed considerably in their estimation of specific annual flows, the reconstructed system "state"--whether the flows were above or below average--was very similar among the reconstructions. Thus, Jim Prairie of Reclamation, with Balaji Rajagopalan of the University of Colorado and others, devised a novel method in which the system state information was extracted from the tree-ring record, but the specific flow magnitude assigned to the system state in a given year was taken from observed flow record. In greater technical detail: First, a non-homogeneous Markov model with a kernel estimator was applied to the tree-ring record, generating a 60-year sequence of system state (e.g., wet-dry-dry-dry-wet-dry-dry-wet-wet-etc.). Then, a non-parametric k-nearest-neighbor technique was used to conditionally resample years from the observed record, to assign annual flow values to the state sequences. This process was repeated 500 times, generating 500 60-year simulations. The resulting "paleo-conditioned" flow simulations encompassed a rich variety of streamflow sequences (droughts and wet periods), including sequences not seen in the observed record. For example, more than half of the 500 simulations had droughts that were longer than the longest drought (5 years) in the observed record. In preparation for further modeling, the paleo-conditioned annual flows were then temporally disaggregated into monthly flows, and spatially disaggregated from one node (Lees Ferry) into 29 nodes, using a new non-parametric disaggregation technique. The disaggregated monthly flows were input into CRSS (Colorado River Simulation System) the USBR's long-term basin planning model. Multiple simulations of the CRSS with the paleo-conditioned flows showed, not surprisingly, greater probability of system shortages than when CRSS was run with flow simulations resampled (using the index sequential method) from the observed record. The analyses described above appear in Appendix N of the Final EIS. Presentation: Combining paleo-reconstructed variability with observed and projected future flows: the hydrologic sensitivity analyses in the recent Shortage FEIS and an ongoing study, Jim Prairie, USBR (Boulder City, NV, November 13, 2008). For other resources about this application, see Jim Prairie's personal web page. In February 2008, a paper by Tim Barnett and David Pierce of Scripps Institute, published in Science, caused a stir among water managers with its assertion, based on climate model projections applied to the observed streamflow record, that there was a 50% chance that Lake Mead would go dry by 2021--thus signaling the failure of the Colorado River system to cope with changing future conditions. A number of observers challenged the authors’ conclusions because of faulty assumptions in their modeling of the river system, but the question they raised is a very salient one: What is the vulnerability of future climate change to the Colorado River system under current operating conditions? Later in 2008, the Bureau of Reclamation funded a new study that used different methods than Barnett and Pierce to approach that question. First, the group led by Balaji Rajagopalan of the University of Colorado used the Meko et al. tree-ring reconstruction of Lees Ferry streamflow [link] to perturb the observed streamflow record to reflect the greater variability seen in the 1200+-year tree-ring record. Then, instead of using GCM output to derive a single scenario for reductions in future streamflow, they tested several different reduction scenarios. They also assessed six different scenarios for future demand and system operation rules. Then, they modified the assumptions of the Barnett and Pierce water balance model to better match the actual system operation (e.g., evaporative loss from reservoirs, intervening flows between Powell and Mead). All of these data were input into a greatly simplified version of Reclamation's CRSS model. These analyses indicated that the risk of the Colorado River storage “going dry” was much less than shown by Barnett and Pierce (2008), with a 5% risk by 2026. However, that risk increased significantly at time frames beyond 2026, and further, the risk increased in a non-linear fashion with larger reductions in flow, so that the risk of drying was 35% by 2056, assuming a 20% reduction in flow. In 2009, Barnett and Pierce published an updated analysis in which they expressed future risk in terms of probability of meeting, or not meeting, projected future water delivery to the upper and lower basins.